On September 29, the MESSENGER spacecraft will pass by Mercury for the third time, flying 141.7 miles above the planet’s rocky surface for a final gravity assist that will enable it to enter orbit about Mercury in 2011. 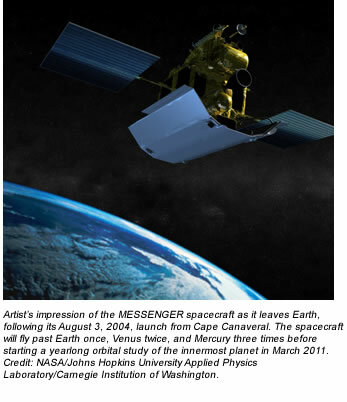 This encounter will also provide new observational opportunities for MESSENGER’s Magnetometer, designed to determine the structure and origin of Mercury’s intrinsic magnetic field. The comparison of magnetosphere observations from MESSENGER’s first flyby in January 2008 with data from the probe’s second pass in October 2008 provided key new insight into the nature of the planet’s internal magnetic field and revealed new features of Mercury’s magnetosphere, explains Brian Anderson, of the Johns Hopkins University Applied Physics Laboratory (APL) in Laurel, Maryland, MESSENGER’s Deputy Project Scientist. The probe’s third flyby of Mercury later this month will take it again over the planet’s western hemisphere, and the observations will be used to refine the estimate of the planetary magnetic field, Anderson explains. The behavior during the second flyby was markedly different from that found in the first flyby, demonstrating the profound influence of the solar wind environment on Mercury’s magnetosphere. “The third flyby is the last opportunity to survey the magnetotail and magnetopause regions in the equatorial plane, and the contrast in the system’s structure under different solar wind conditions already observed make it likely that the third flyby will yield new insights and perhaps more surprises for the dynamics of this smallest and most highly variable of the solar system’s planetary magnetospheres,” Anderson says. As with the previous two flybys, the Magnetometer will record the magnetic field at the highest available observation rate of 20 vector magnetic field samples per second for a period of twelve hours centered on the time of closest approach. “This observing plan guarantees the highest possible science return from the encounter and will provide key observations to guide the magnetic field investigation plan for the prime orbital phase of the mission,” Anderson says.